Miki is a 14 year old who is a member of ‘Project Fairy’ from Studio 961, who are 765 Production studio’s rivals. Miki is has a very laid back attitude to life and things come easy to her, looks singing ability, and she apparently receives 20 confessions of love per day from boys. Although she is not cruel in her intentions she does however believe she can make it to top idol with little effort. This Miki is the Strawberry Snow edition Miki. 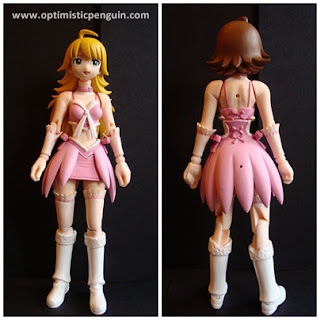 Miki’s sculpt is very cute and that of a young teenage girl. Both of her heads are nicely sculpted, I especially like her blond hair how it flicks out at the side. Her body sculpt is nice, very cute little waist and a good bust size. Her dress design is just great with her skirt having Soft PVC bows and underskirt, allows her more leg movement. Her top is also very cute. Her gloves and stocking are great with some nice detailing around the tops. Over all she is a very feminine and pretty sculpt. Miki is nicely painted the detailing on her stocking and gloves is very neat, both sets of hair is well shaded, and her dress just lovely, also her choker necklace is very well painted. Her colour scheme is great, pink and white and very cute, I love how they have incorporated more than one shade of pink in the Miki figure, it just adds so much more to her costume. Her accessories are well painted, the cat ears have nice little deep pink tips, and her demon hands are very cool, nice dark paint on the paddy paws, very good. 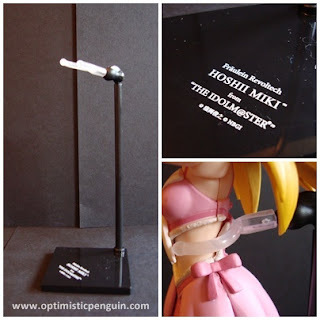 Miki uses the E.L.F joint system, which is used by all Fraulein Revoltechs. Her hands are on Revoltech joints, which move forwards and back and rotate, her elbow is a hinge peg joint, bending and straightening, a very natural movement, she has two joints at her shoulder, a swivel joint at the top of her arm allowing her arm to rotate, and at her shoulder a Revoltech joint so she can move her shoulder forwards back, up and down, and rotate. Her neck has a Revoltech joint, so she can look up and down and side to side, however she can’t really look back to far with her blond hair on. At her bottom/top of her thigh she has a Revoltech joint that moves forwards, but not backwards or side to side. Half way down her thigh she has a swivel joint so her leg can turn in and out, which is nicely disguised by her stockings. Her knee is a hinge joint, giving her a natural movement of knee going backwards. Lastly at her feet she has a Revoltech joint allowing her to point and flex, and can turn in and out, in and out movement somewhat restricted by her boots though. Her skirt does limit her from sitting down, but can be removed, though I am sure she doesn’t want to sit down in just her underwear. She also has a Revoltech joint in the middle part of her blond hair, so that she can remain in her stand with this hair on. Only complaint is that since her elbow joint is on a peg the left one pops of occasionally, which is a bit bothersome. Miki comes with the standard Fraulein Revoltech stand, which is black and has her make (Fraulein Revoltech), her name and the series she comes from written on the base. The stand itself consists of a base a pole which pegs into it, and then a two jointed Revoltech Joint, which goes in the top of the pole and then into a U shaped holder. The thing to note about the Fraulein Revoltech stands is that they are too tall for the characters, and so when in the stand their legs dangle in the air, which is rather annoying at times. 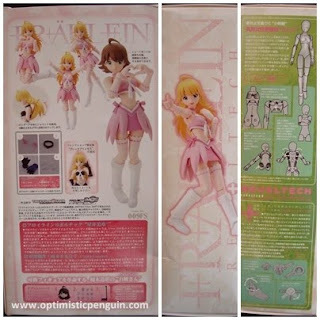 Miki comes with the standard Fraulein box, with a window at the front, a picture of her posing on the side, on the other side details and pictures of the E.L.F joint system which the Fraulein Revoltechs use, and on the back pictures of her accessories and some of the poses she can do, and other info, on the bottom of the box all the authorized info, with her authorization stamp, and warning statements (all writing in Japanese). Inside the box she is held between two moulded pieces of plastic, with a space for her hands and extra head, and her other accessories and stand came in plastic bags attached to the back of her casing. This is standard packaging for the Fraulein Revoltech line. She also came with promo flyer of current and new Revoltech products. Also take note of the authorized sticker, each figure should have one. 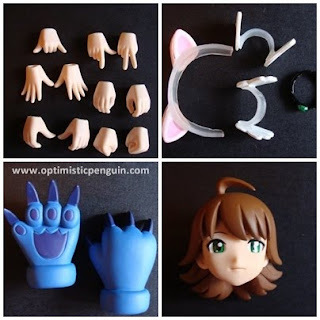 Miki comes with cat ears, a jewelled necklace, a pair of demon hands and a pair of winged anklets. Her cat ears are great, I love them and her demon hands are really cool. And with the winged anklets she can look like that Greek messenger god who could fly around because he had winged shoes. Miki also is one of the first Fraulein to come with a different face, she has an alternative face and an alternative head, each face can be removed in put in which ever head, either the blond hair or brown hair, a very nice feature. 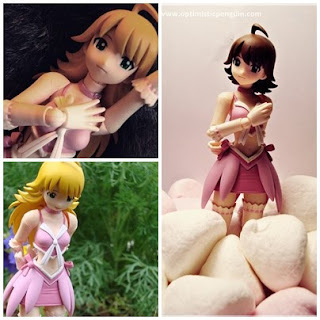 Miki is a lovely figure, her dress design is gorgeous and looks great in pink, her accessories are good, and when joined with the accessories I have from Mami and Ami I can get some full on demon and cat action. 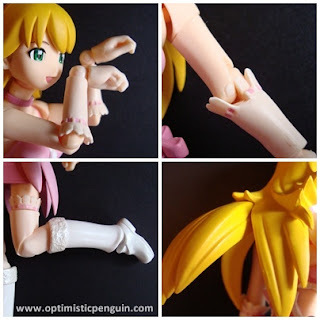 If you collect all the IdolMaster Frauleins you get interchangeable accessories, as Miki has a small hole in her back to attach wings, and one in her skirt to attach a cat tail to. 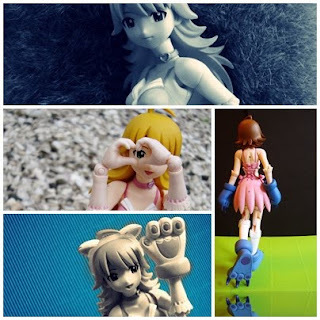 Over all Miki is great, she has that fantastically cute Fraulein sculpt and her posability is great, she is a very nice visually appealing figure, very cute and sweet, and now that I have all but one of the IdolMaster Frauleins I have a lot of fun mixing and matching their accessories.